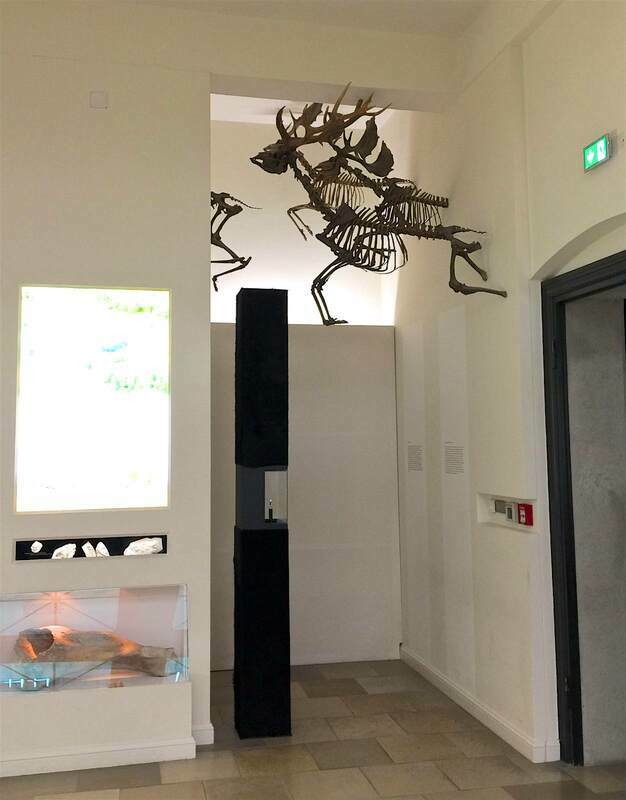 Halle's State Museum of Prehistory (Landesmuseum für Vorgeschichte) has impressive pieces and ways to display them. The display of Bronze-Age axe heads (above and right) is a dazzling way to emphasize how ubiquitous these tools were: they were the tool of their day, essential to some of the most basic life functions. Precious and finely worked, yet so necessary as to be owned not only by the elite. (The smart phones of their day?) I found the display not only visually pleasing but a good teaching moment for precisely that reason. 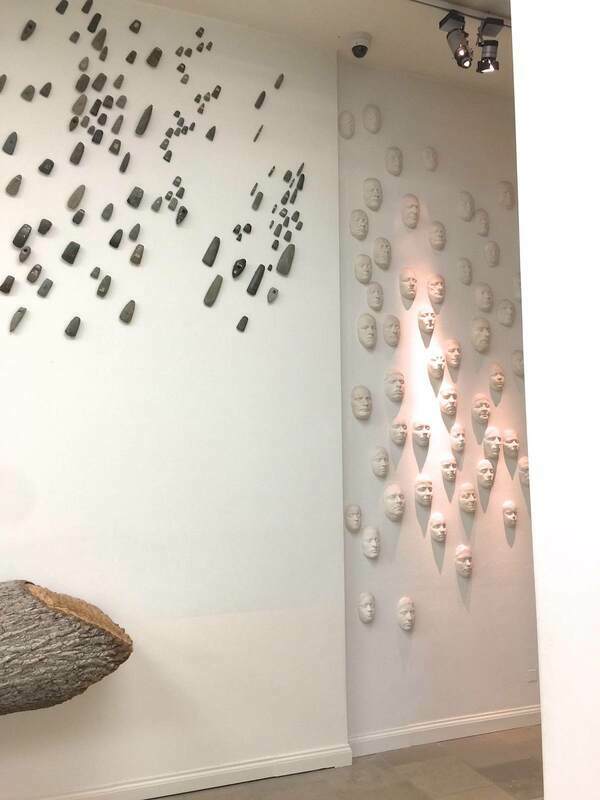 The juxtaposition of the axe heads with plaster faces in a modern art piece was also arresting! 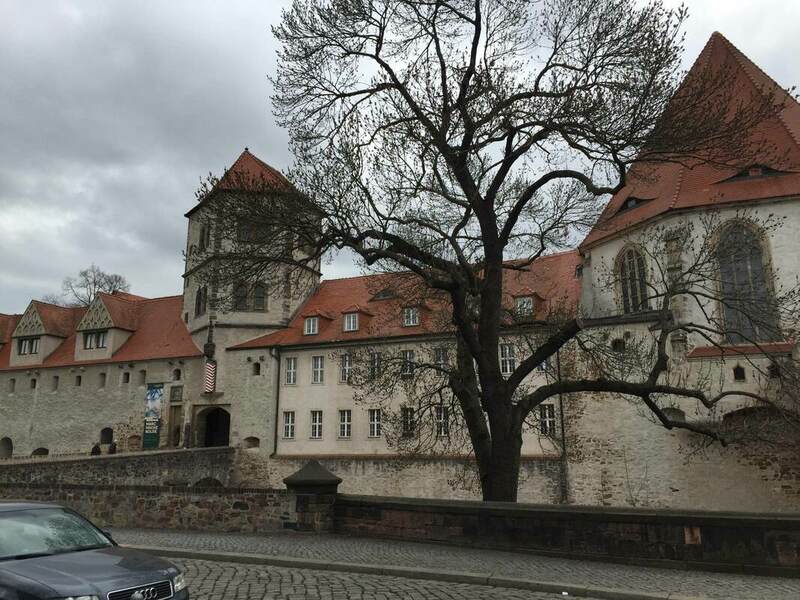 One last post will conclude this series on the Landesmuseum Hannover. 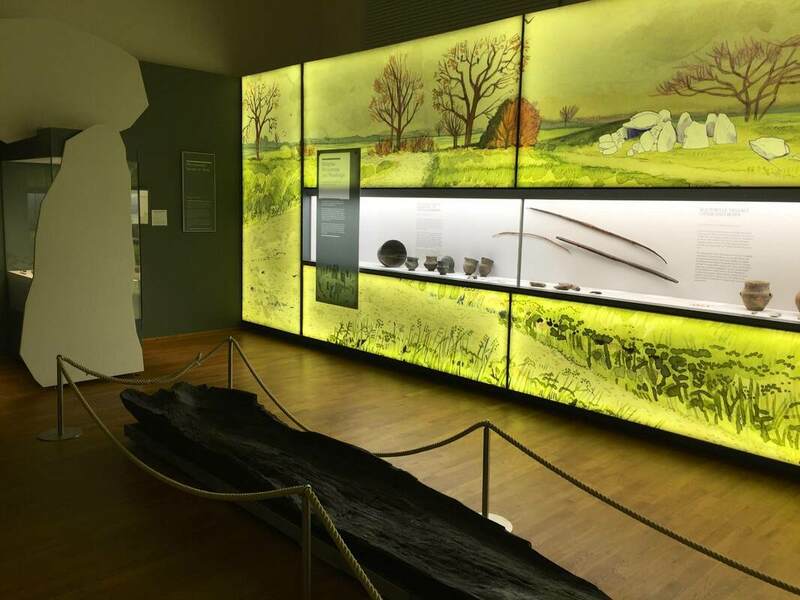 These expansive walls of watercolor landscapes, lit from behind with an even glow, run throughout the exhibition of Saxon archaeology. As an artist, art historian and admiring niece of a wonderful mural artist, I fell in love with these immediately. But they operate beyond the realm of personal preference, I swear! 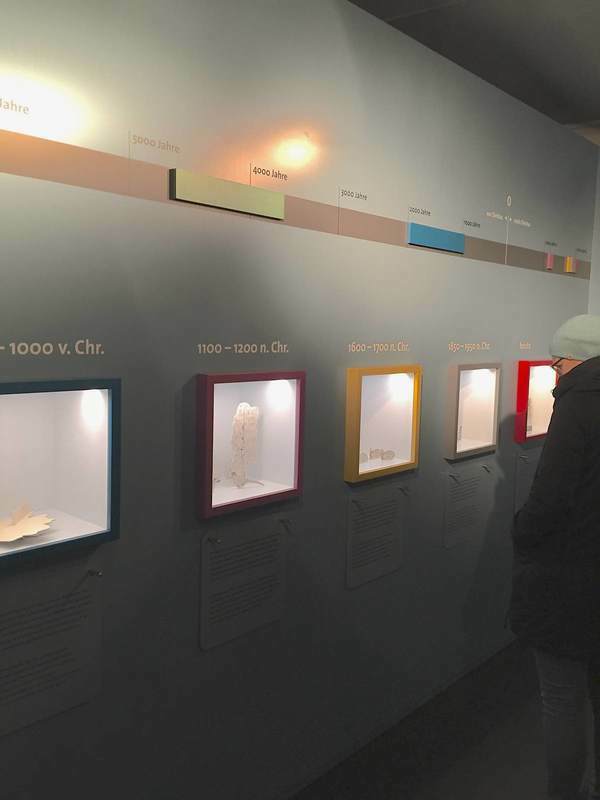 Not only do they add color to the display without complicating the view of the objects themselves—which remain on a white ground—but they flesh out the objects' use contexts. 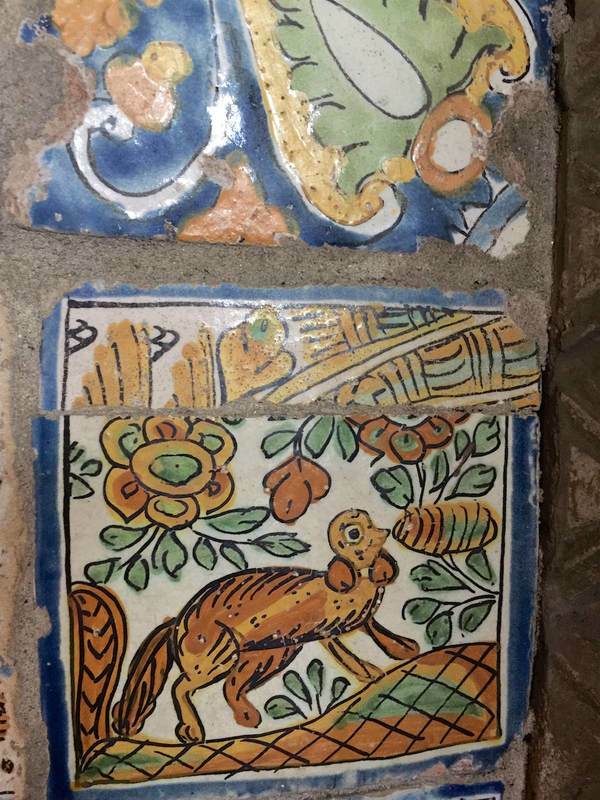 Each mural is crafted to show the phase of prehistory that the objects belong to. The type of housing shown is accurate to the time; so is the state of nature or agriculture. But to be honest, it is so bewitching to see a gorgeous watercolor at this scale that I could care less about the content... Oh wait, not really! Bad art historian! The keen-eyed will have seen that the white cutouts of boulders at left are represented in the painting at right—and that this sort of construction to contextualize the objects was discussed in the last post. 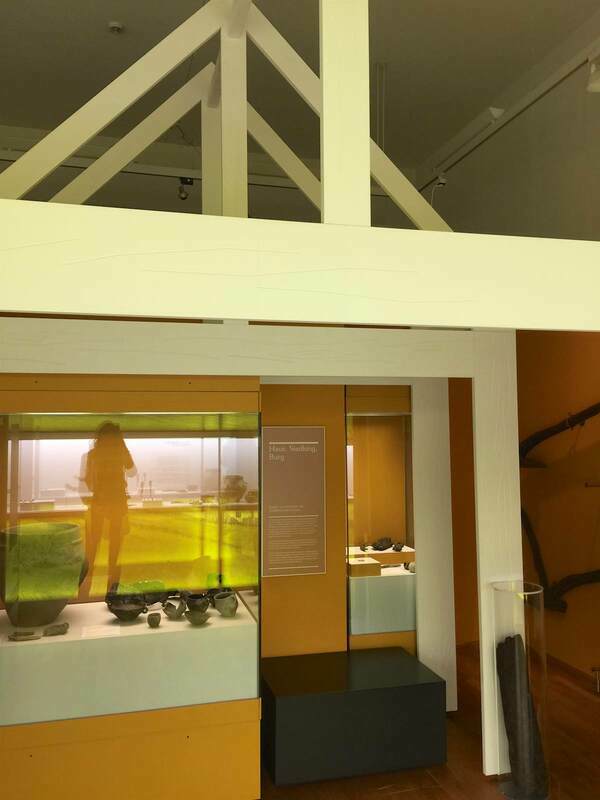 Another pleasing aspect of the Landesmuseum Hannover's galleries are the framing devices for the objects. Archaeological objects in particular can be small, withered, corroded, or otherwise unimpressive; sometimes they need a little help to get their due. 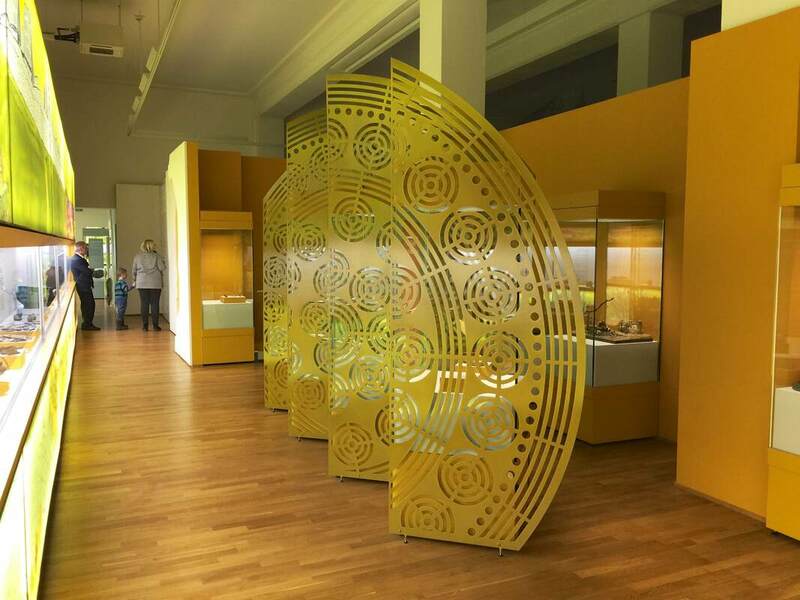 These gold partitions affixed to the cases of gold jewelry and precious objects from Bronze-Age Germany (Lower Saxony, to be precise—of which Hannover is the capital) serve this end. With their color and concentric-circle design, they draw attention right away—and perfectly echo the objects in the cases! Both the spiraling gold wire of the jewelry (below right) and the circles on the astrological discs (below left) become more obvious with this big visual hint. What is more, the cutouts in the gold screens offer a peekaboo with the objects that makes looking more fun (just like the dividing wall from this post!). 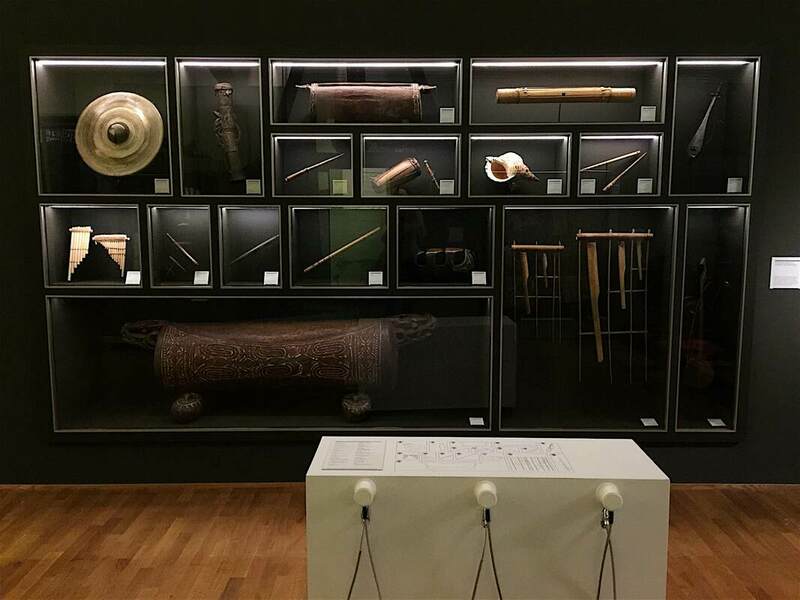 Another element of the Landesmuseum Hannover's ethnographic displays that I quite liked was this wall of musical instruments from Sumatra and Papua New Guinea. 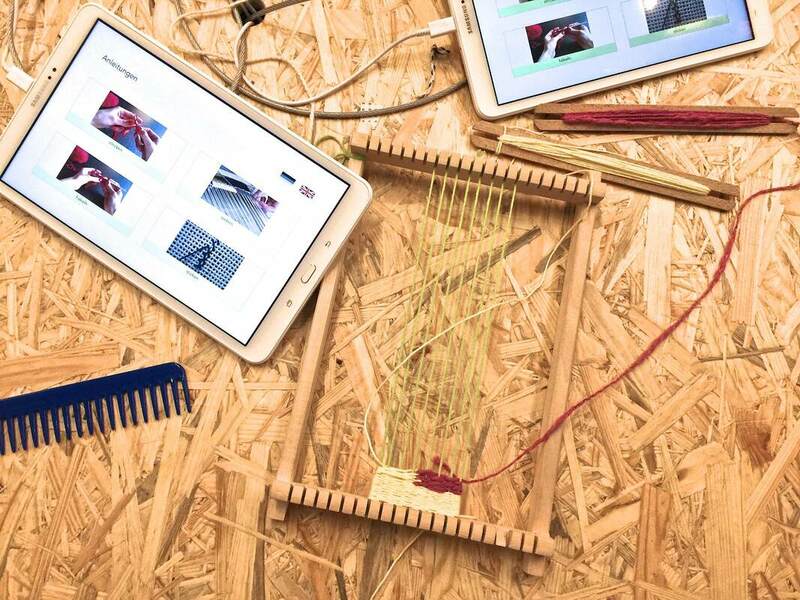 It's not only a beautifully minimalist, vertical display—an unusually artistic layout for such practical objects—but it is brought to life by recordings of each instrument at the touch of a button. Seated at the white podium, you can put an earpiece to your ear and select an instrument from the diagram to listen to. Watching two girls do this together, taking turns choosing, was a sight to warm any curator's heart! Plus, this display is in the same room as the complete gamelan instrument ensemble, which is even used in concerts. Now that's really bringing the displays to life! Many museums are currently asking themselves how to appropriately deal with their ethnographic collections (see links in my previous posts on the subject). Some major European museums, although notably not all, are now openly acknowledging the role that colonialism played in their acquisitions. Reading the work and watching the lectures of Bénédicte Savoy on this topic would be an absorbing job for a wonderful few months. 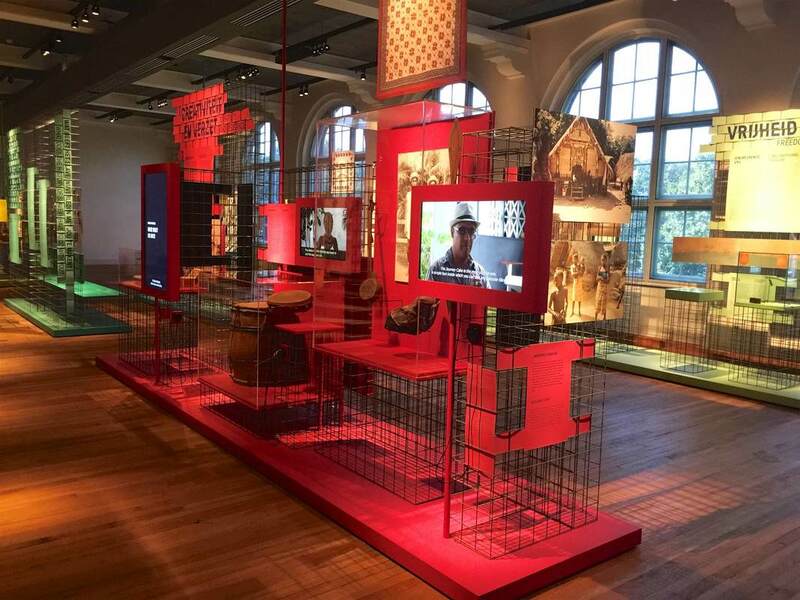 Some museums are even putting on exhibitions about their colonial past, such as Voices from the Colonies at the National Museum of Denmark. 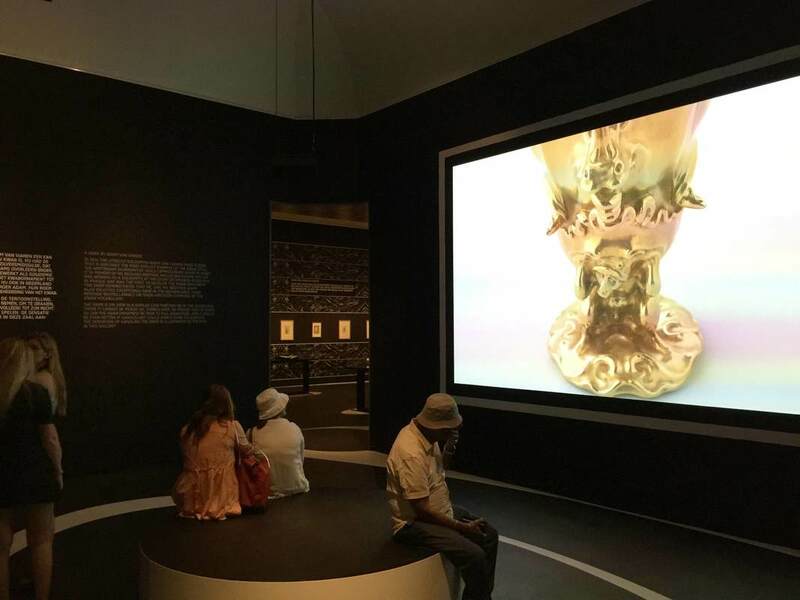 While it has been rightly pointed out that ethnographic material is not the only site of colonialism in museums—that museums themselves are colonialist structures—it is certainly one of the most obvious. And if the museums themselves do not take action, others will: the "Guerilla, Activist-Led Tour of Looted Artifacts at the British Museum" made headlines last year. 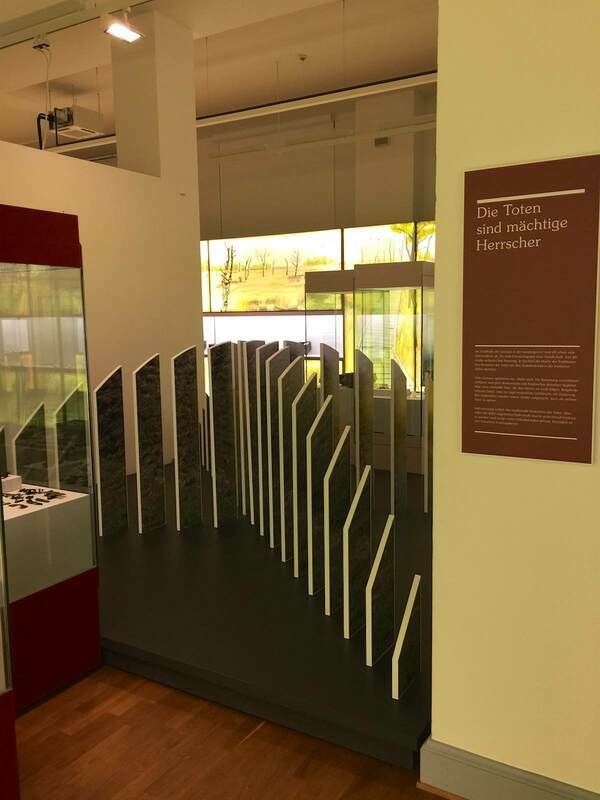 ​Against this background, the Landesmuseum Hannover has taken commendable action in its own ethnographic displays. 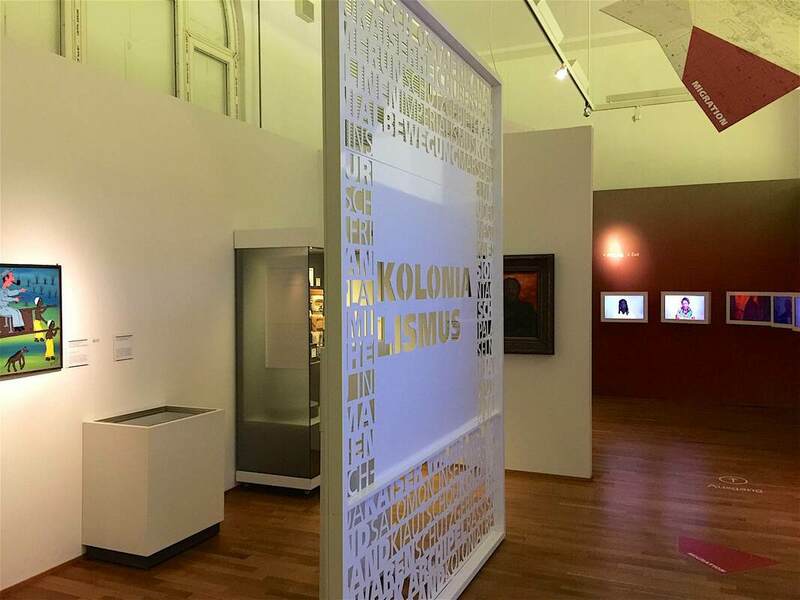 Particularly striking is the section marked off by a decorative metal dividing wall stamped with the word "Kolonialismus" in the center. This is an imposing marker of the surrounding area, and invites a curious new way of looking through the cutout letters (see photo above). 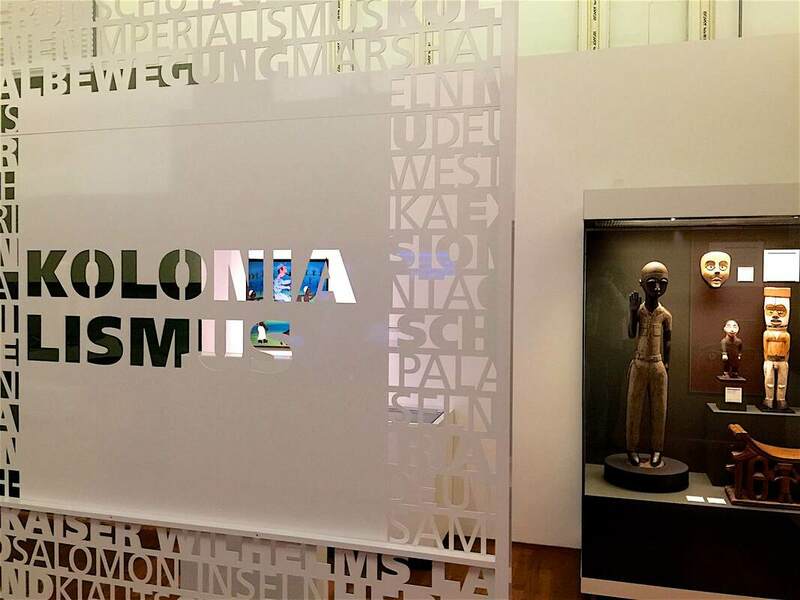 On display here are objects presented in a story of colonial interaction, from depictions of visiting Europeans made by Africans whose lands were being colonized, to a 19th-century painting titled "Smoking Moor" for which the Landesmuseum has provded a modified label: "Moor" has been crossed out and "Human" (Mensch) added instead. 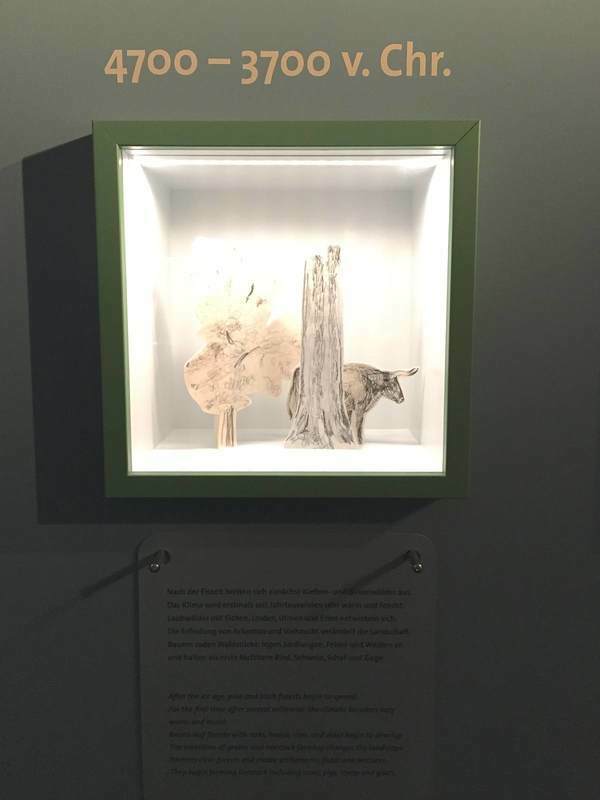 It is a small but effective way to reframe objects we might otherwise pass over, and to make us question the metanarratives of museum exhibitions. 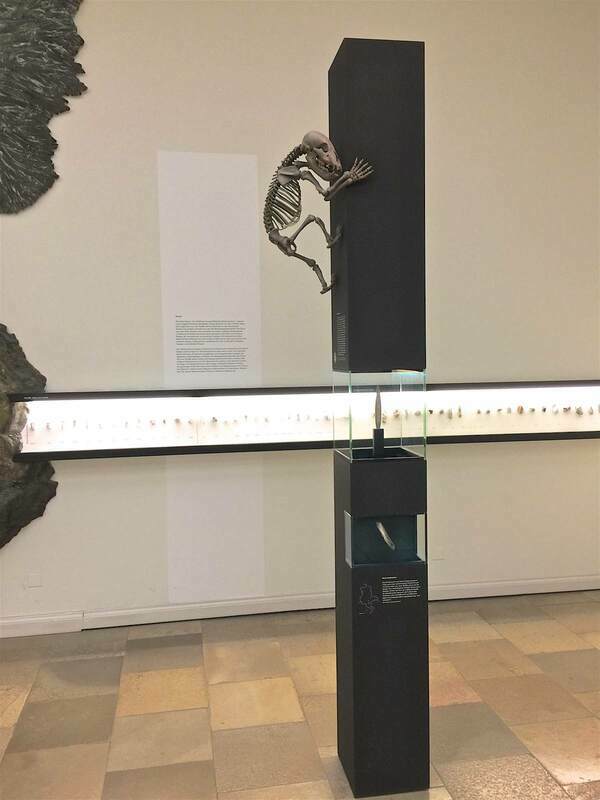 Such a simple yet effective idea: an object-of-the-month display at the museum entrance. 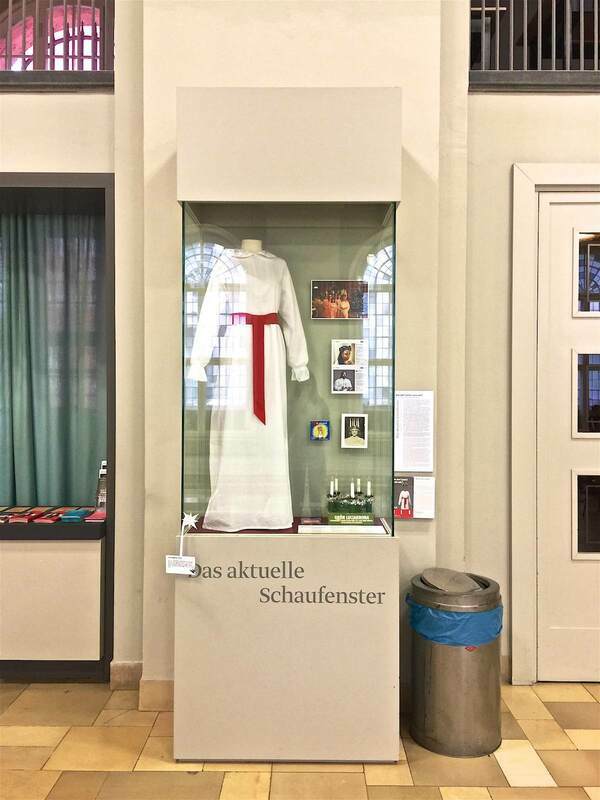 Here it's the Museum of European Cultures in Berlin, and the object in "Das aktuelle Schaufenster" (the current showcase) is a contemporary Swedish dress used in the celebrations of Saint Lucy. You can see the doors of the main entrance just to the right. What a great way to bring out of storage some objects that may not fit into the other exhibitions, and draw in the visitors as soon as they step over the threshold! 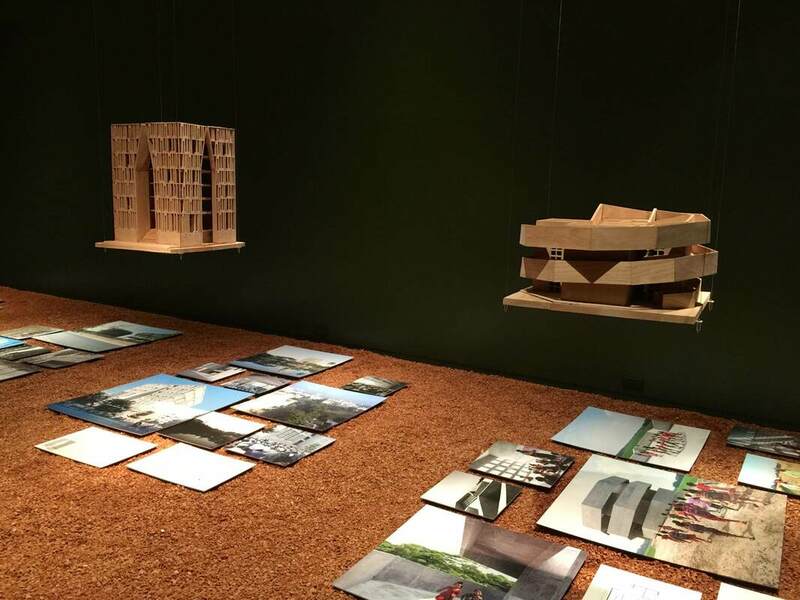 Another beautiful and effective display concept at Aedes Architecture Forum (if less mind-blowing than the subject of the last post) belongs likewise to the show FARAWAY SO CLOSE. A Journey to the Architecture of Kashef Chowdhury / URBANA, Bangladesh. 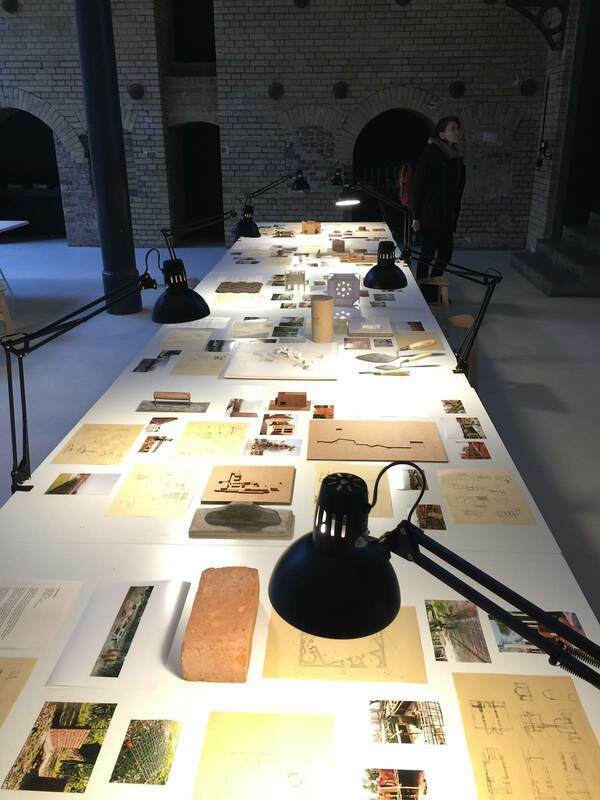 Here the architect Chowdury's drawings, models, and materials (or photos of them) are laid out on drafting tables lit by arm lamps, as if you were looking over his shoulder as he works. It is an intimate way to experience the material, far more so than if it were hung on a wall, let alone pressed behind glass. 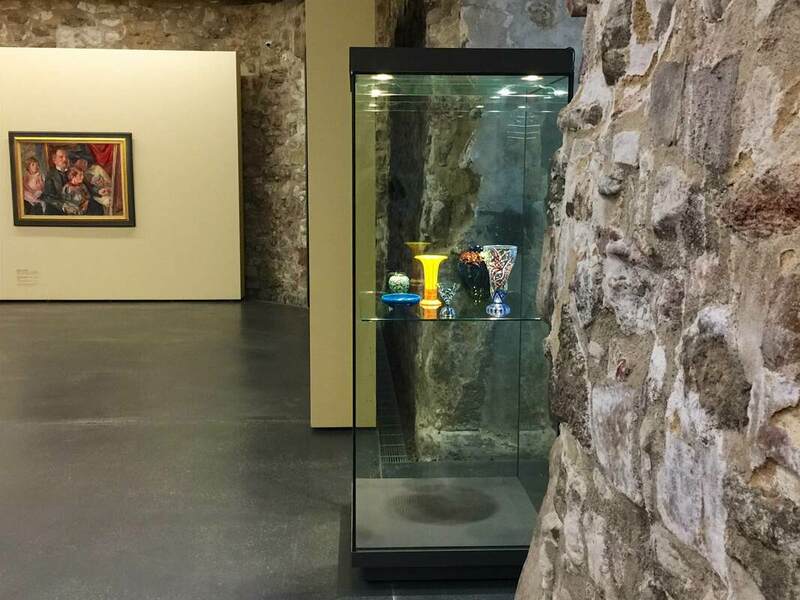 The openness of the display couldn't directly translate to a bigger venue, where the chance that pieces would go missing is higher, or to an exhibition with originals that would be severely damaged by being touched. But it is such a lovely way to encounter the material on human terms, I wonder if it couldn't be adapted to more venues. Peeking into the artist's studio is, after all, endlessly alluring. 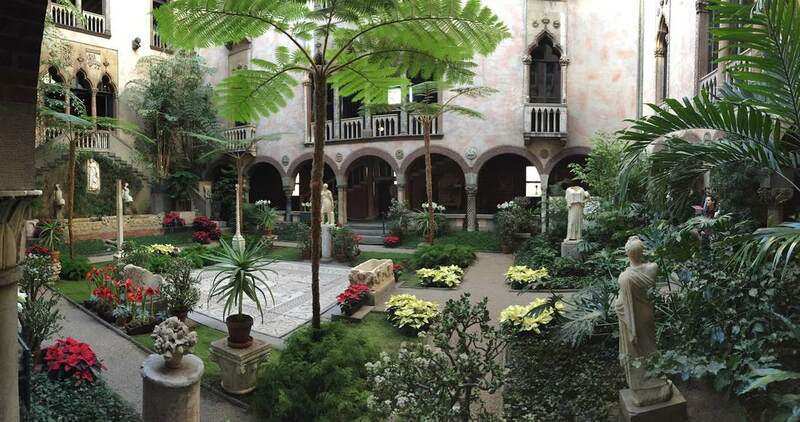 In laying out her art museum in Boston, which opened in 1903, Isabella Stewart Gardner sought to ellicit an emotional response in her visitors. Rather than teach them something intellectual about the works on view, she prioritized aesthetic impact. 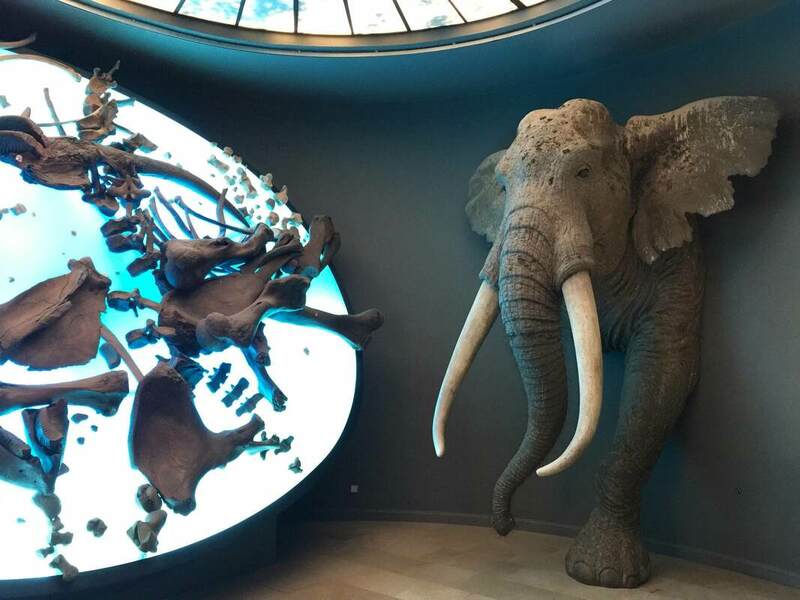 And she was able to realize this vision completely, being the sole visionary and financier of the museum—not to mention a seemingly headstrong personality. The effect is plain throughout: there are nearly no labels, and the handful I saw named at most a culture and century. The organization of the collection in the galleries is only vaguely defined by time and place, and rather more by visual harmony: an 18th-century Russian lampstand finds its place beside a Turkish textile and a Japanese basin, while the "Spanish Cloister" is wallpapered with tiles from Mexico (right) and oriented toward its show-stopping highlight, a huge painting by John Singer Sargent. Roman sarcophagi, meanwhile, are sprinkled throughout both the Cloister and the Courtyard (above). 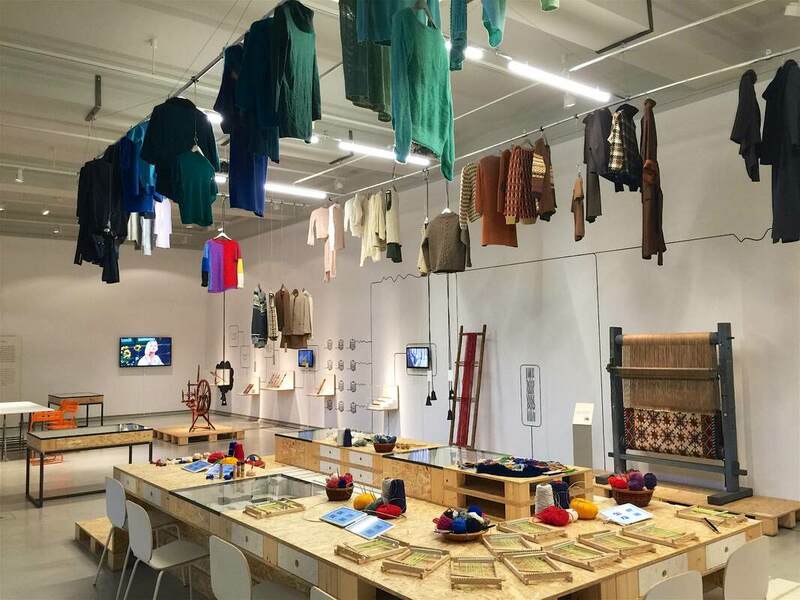 This is no ordinary concept of museum display! It is a treat to feel Mrs. Gardner's touch in every arrangement, and to imagine her making it all "just so" for her salon guests. 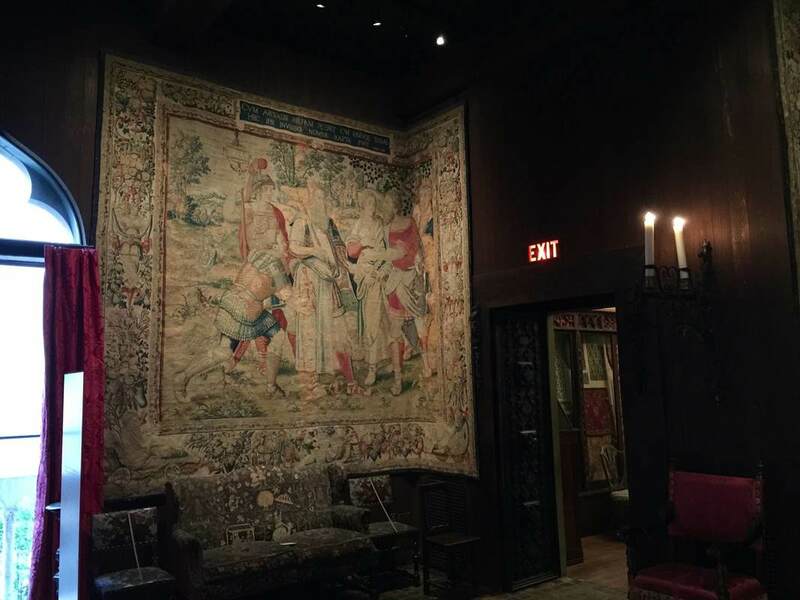 Sometimes her touch seems more enthusiastic than professional, as in the tapestries that have been bent in order to fit into a corner (below), or the row of pictures hung on the short side of a cabinet, as if to use every possible inch of vertical space. 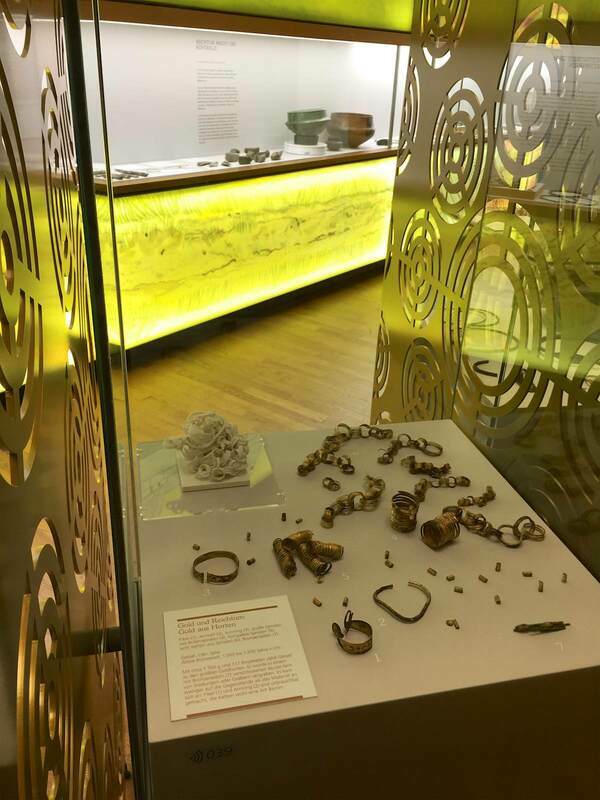 The great achievement of this display concept is letting viewers really look at the pieces, make associations, think creatively and personally about what they are. We cannot be distracted by text or multimedia stations; we have to just look at the objects. 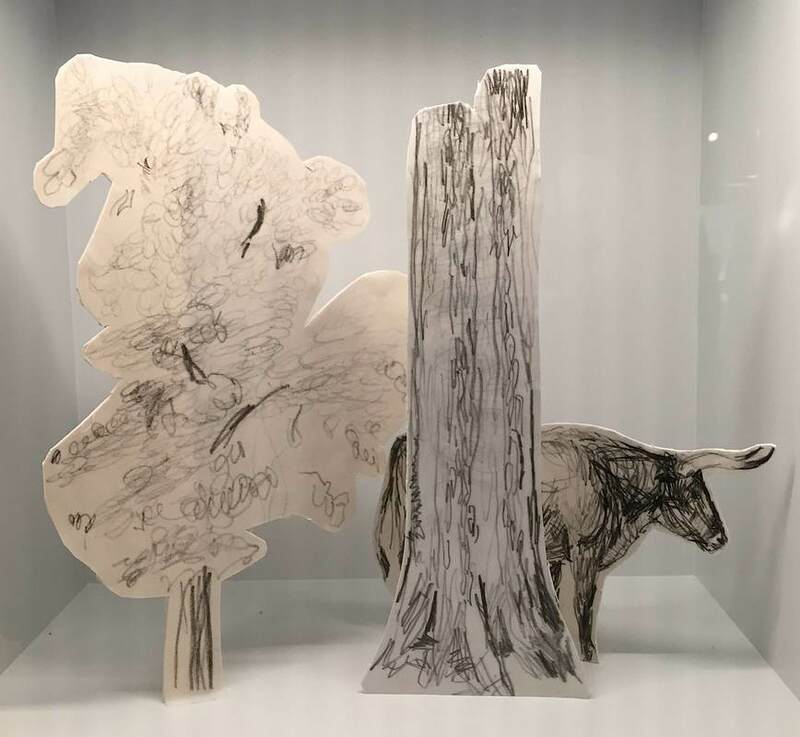 And if the immense variety and quantity of objects can be overwhelming, this is in part a result of the ceaseless acts of imagination prompted by these pieces—just what Mrs. Gardner was going for. At one point Lana Hum calls her job a sort of translating, in that she and her team talk with curators to understand the vision and then get to work shaping that into a realizable form. This metaphor seems really useful for thinking about what exhibition design can be. 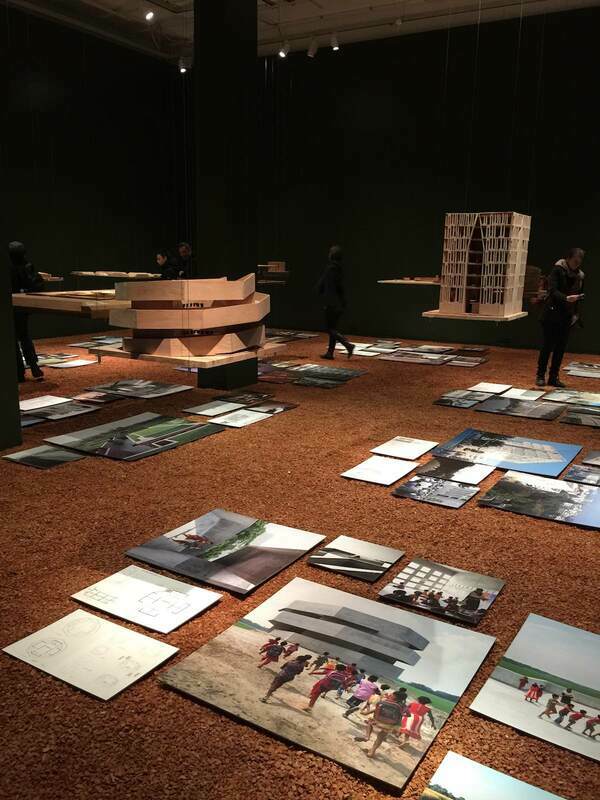 She also talked about exhibition design as a push-pull between, on the one hand, the "open space" that lets a visitor choose a path, and on the other a planned (often chronological) route through the show. Before hearing it mentioned here, I had never thought about the need to get fire department approval for every new exhibition layout! But it makes sense that the emergency exits would need to be verified. The penultimate question is brilliant for getting down to the essence of any job: What counts as an emergency in your job? For most of us, this is far from a life-or-death scenario; that certainly offers some perspecitve. I look forward to hearing the other two episodes about MoMA's operations! My presentation on Friday led to a vibrant discussion—the most gratifying possible outcome of a talk! We discussed how displays of ancient art can achieve certain effects together with its visiting audience. Particularly in view of the warm reception it received, I hope that this presentation might spark further ideas in the online community; so here are the slides and talking points to look through as you like. I hope that the conversations will continue to grow and multiply, invigorating our museums and our communities. Ancient Images, Modern Projections. 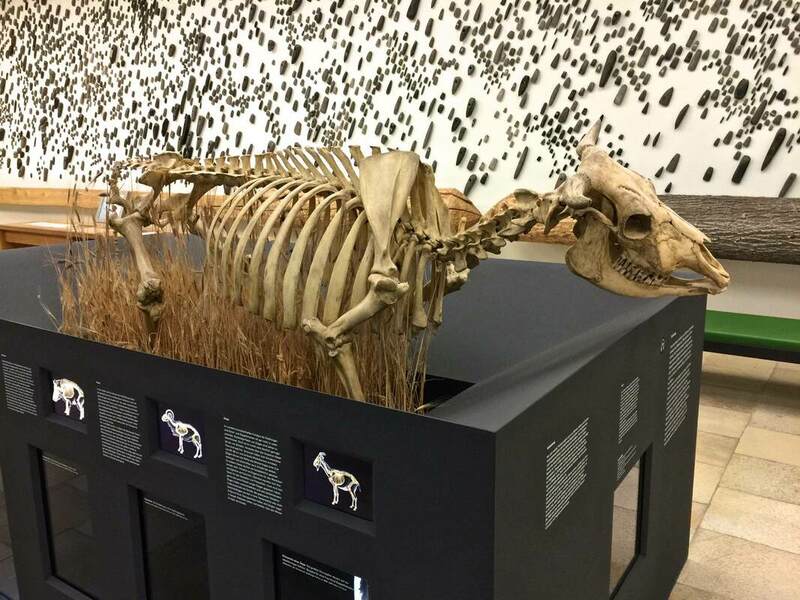 Displaying Complex Narratives in the Museum - this Friday! 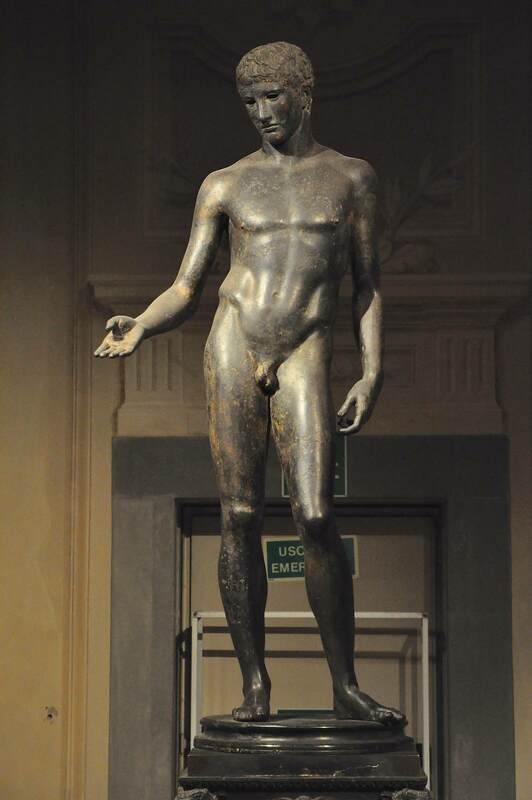 This Friday is a very special day: I'll be giving a talk about museum displays of ancient art! In particular, how they can benefit from an injection of multivocality, uncertainty, complexity, non-traditional narratives, and other conversation starters. Please come and join the discussion! Complete information about the event is here. In preparation for a public forum I'm co-organizing next week (Decolonize Mitte! 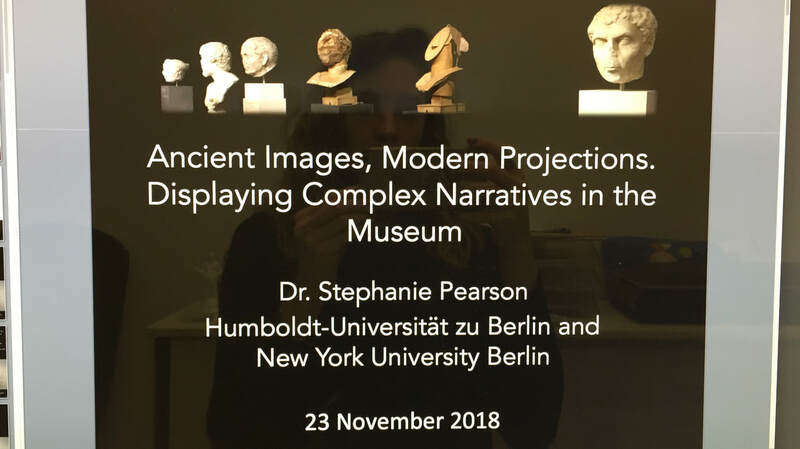 Humboldt Forum, Museum Island, and Schloss—all are welcome to attend!) I've been thinking a lot about ethnographic museums. How can we make them spaces that "work for us," in the sense that they encourage learning, understanding, respect, tolerance, community building, engagement, discourse? 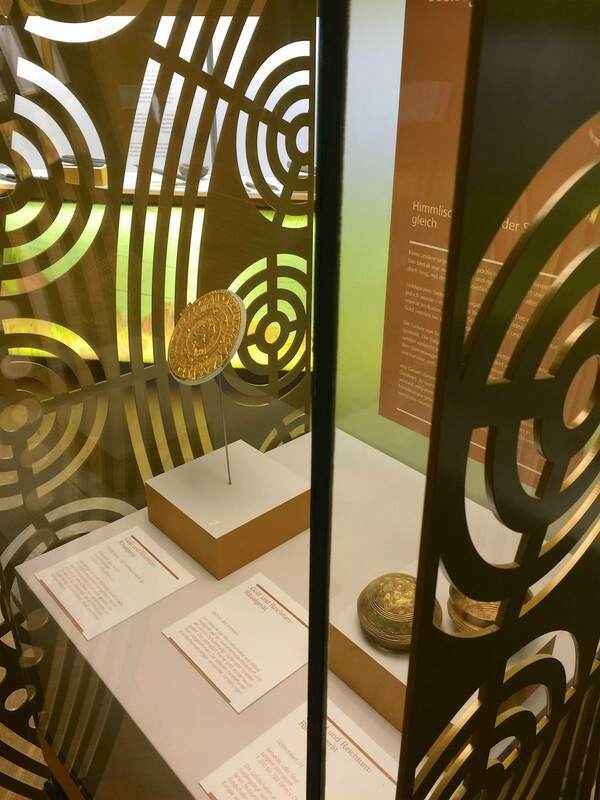 Ethnographic collections are a focal point of current debates on provenance research and how to make museums for a modern, anticolonialist world; they are the crucible from which new metals will be poured, hopefully shaping other museums as well. Antiquities collections, more my area of expertise, can look to them for guidance not only in displaying provenance research, but in engaging visitors by telling human stories in a strikingly candid way. "Today, the uniqueness of many of the objects goes hand in hand with the necessary questions regarding their origin. Who created them and why? How did they come to Dresden? Were these objects given as gifts, sold or even taken from their original owners during the colonial era?" This is a brave thing to put on the homepage of any museum, particularly with the final phrase raising the potential for repatriation claims. Just so the link to find out more about the collection history (pictured above), whose token photo is a Benin bronze depicting a European man aiming a rifle. A more succinct summary of the conflicted acquisition history could hardly be imagined—how honest to put it right up front! A lot of objects are at home in the dark. 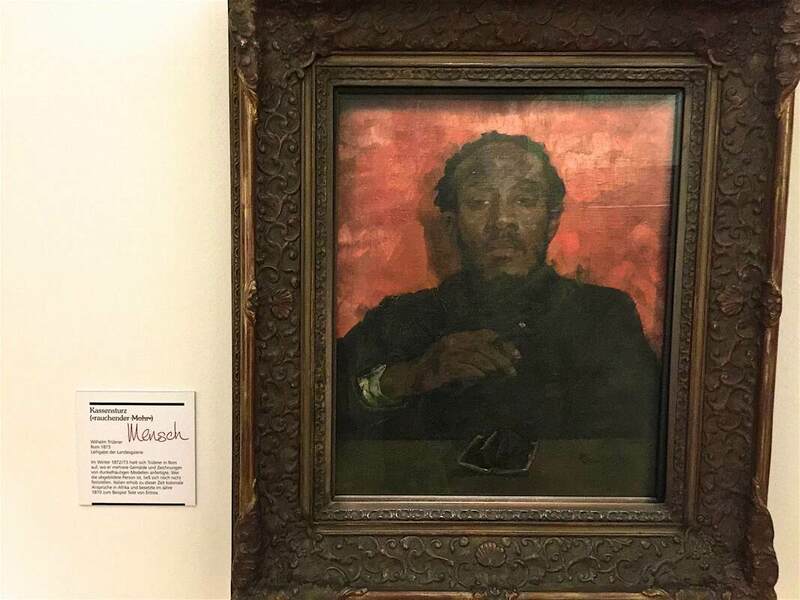 However, in art museums, we are used to illuminating objects in the same even, "objective," investigative manner in which we also write the labels (my critique of the attempt to be objective, and my suggestions for other tactics, are laid out e.g. here and here). 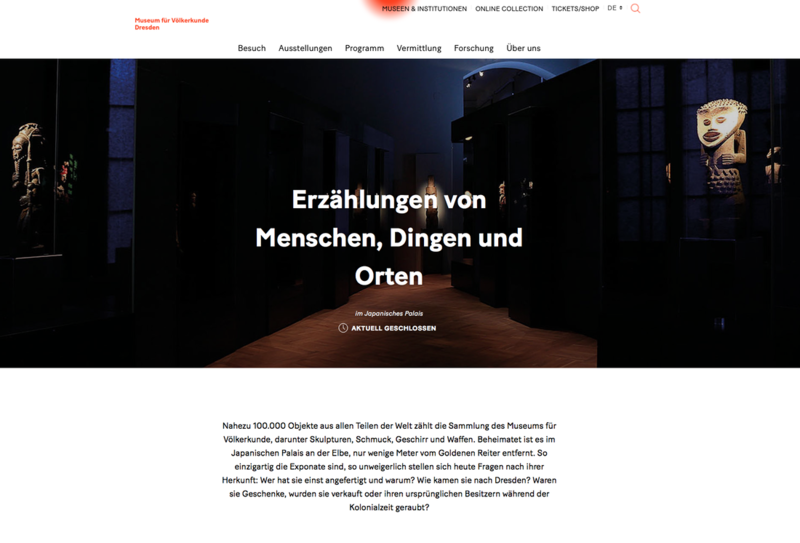 How would it be to put on a whole exhibition about objects in the dark? Not utter darkness, but a recreation of the low-light conditions in which they were originally used. ​A photograph on the ICOM member page (above) got me thinking about this, offering a stunning example of how this idea might play out. A beautiful piece of Islamic tracery or woodwork illuminated from the inside shows its form infinitely better than if it were put under standard museum lighting. Look at the gorgeous pattern it casts over the visitors and walls! 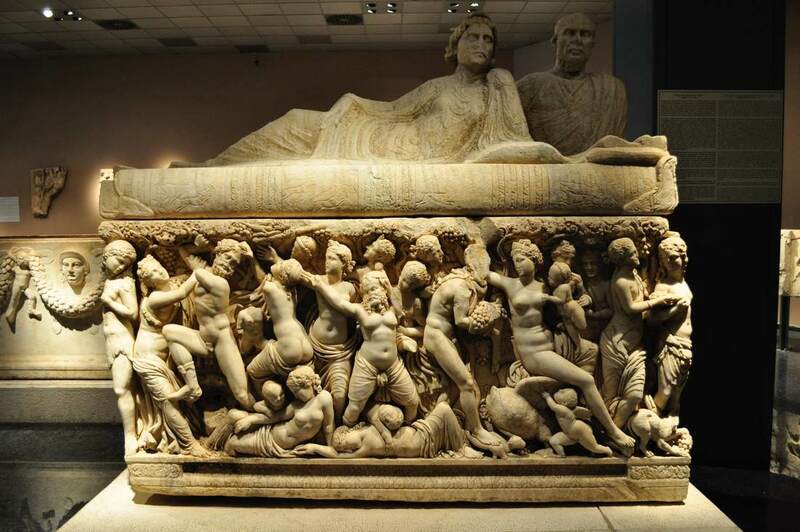 Roman sarcophagi are another genre that would benefit hugely from such a display. Their figures in relief would have danced in the lamplight of the tombs. The dramatic lighting of a sarcophagus in the archaeological museum in Antalya, Turkey gives some idea of how this enlivens the object, but really the lighting has to be flickering orange to achieve the right effect. Lamps themselves look very different when they are their own sources of light than when lit from an external source. The Idolino in Florence, who once held a functional lamp in his hand, may have looked like a real person trying to find his way in the dark! Religious items too would be abundant in this display, as they are so often used in enclosed spaces—temples, caves, household niches, etc. This would be a really fun show to put together! 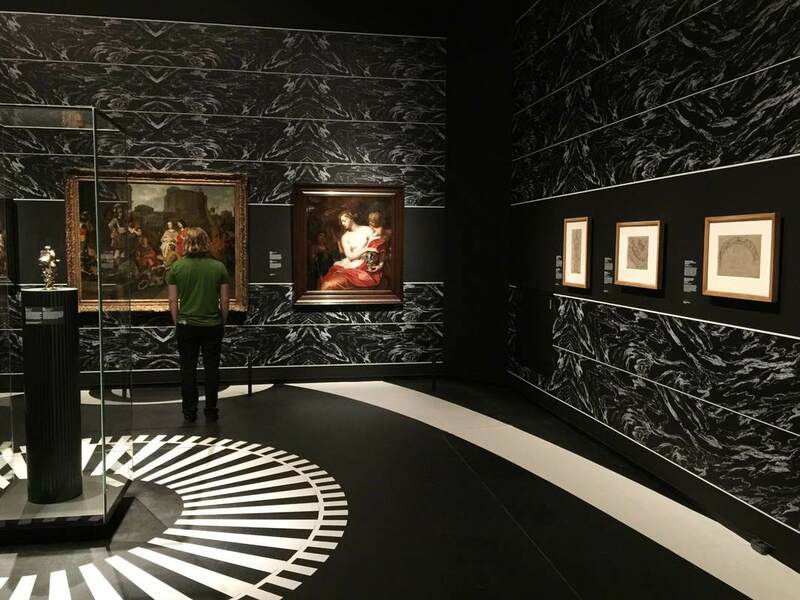 This last post about the KWAB exhibition in Amsterdam's Rijksmuseum concerns lighting. This show got me and my partner-in-museology thinking about the potential for self-directed lighting in museum display. 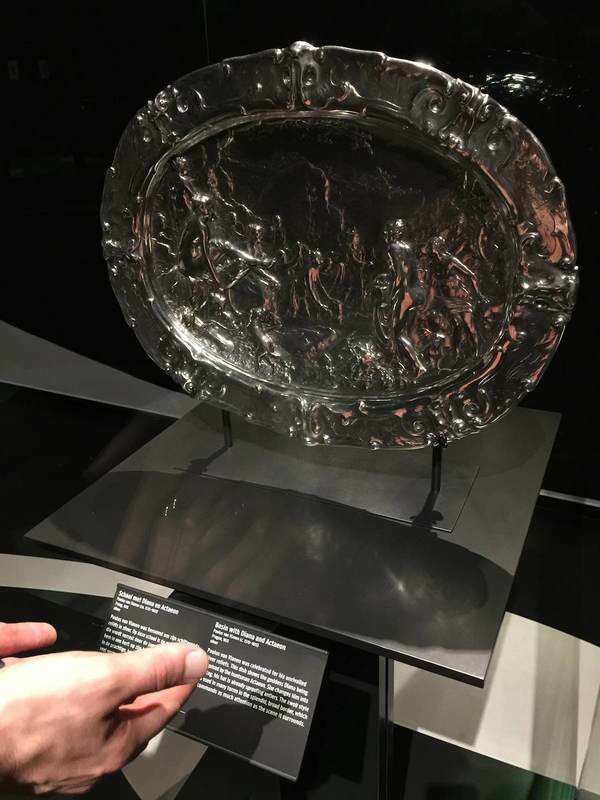 The impetus was this lovely, huge, embossed silver platter. Its fabulously fine relief is hard to see in any detail, not because the lighting is poor per se, but because it is static. 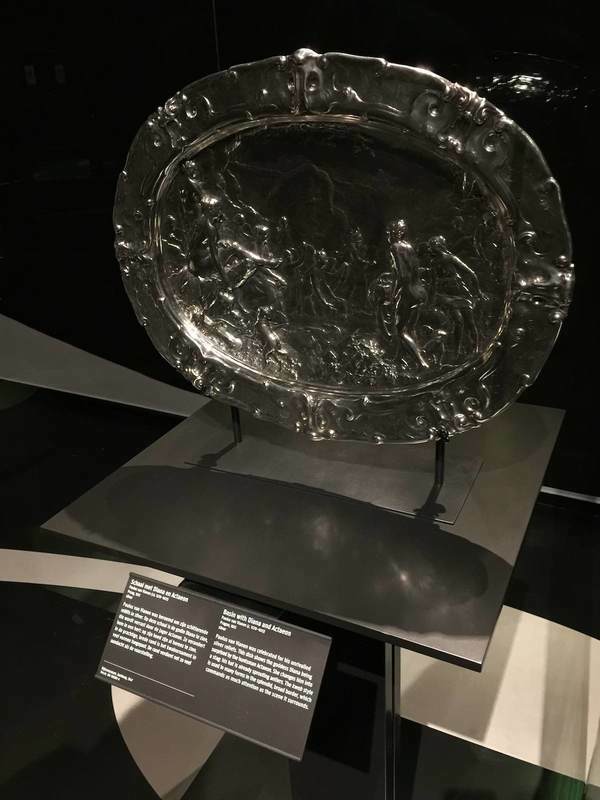 Especially for objects that would have been handled, passed around, held up to the light, or simply displayed in a space where people could view it from different angles, the viewing conditions offered by a museum could hardly be more different. And it can be frustrating to try to make out what all those tiny relief people are doing on this silver thing; even I was inclined to give up and move on to something more decipherable. But adding a couple of pink hands as a reflecting screen (above right) changed everything—even more so when moved from side to side! The addition of not only light but color and movement made the relief eminently more legible. This is the reason that Reflectance Transformation Imaging works so well (here's the process): under different lighting conditions, especially ones we can adjust and move at will, we can perceive relief and texture much more easily. So how about visitor-directed lighting? 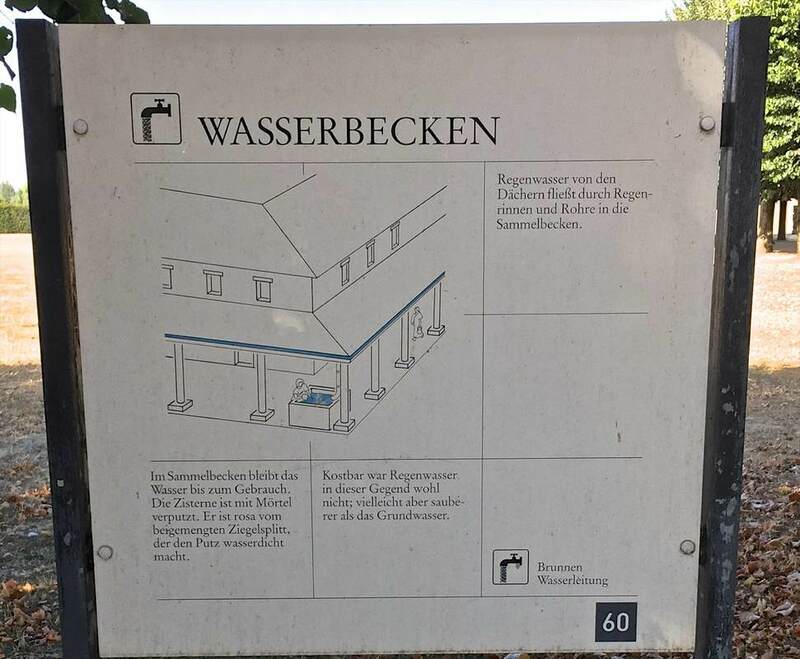 This could be as simple as offering visitors sheets of printer paper at the entrance and encouraging them to use it as a reflecting screen (on objects in glass cases only, if you're worried about paper and people getting near unprotected objects). But personally I think it would be exciting as a central element of a show; it could even be the main topic, "Old Things in New Light." You could experiment with little lights mounted on tracks in front of the objects, so the visitor can slide the light from side to side. Heck, grab that gooseneck lamp from your desk and mount it next to an object—there, you've got interactive, user-directed lighting! There are dozens of forms this could take, and just as many epiphanies about the objects in new light. Let's go wild and see what happens. ​The painting can be used to make an object really pop out at you. The beautiful ebony armoir above (left) gains a whole new life from the white moon behind it. The sinuous curves at the top of the chest stand out against the light background, and the hovering circle gives the piece a lively dynamic—almost as if it were a nocturnal creature standing in a moonlit landscape. 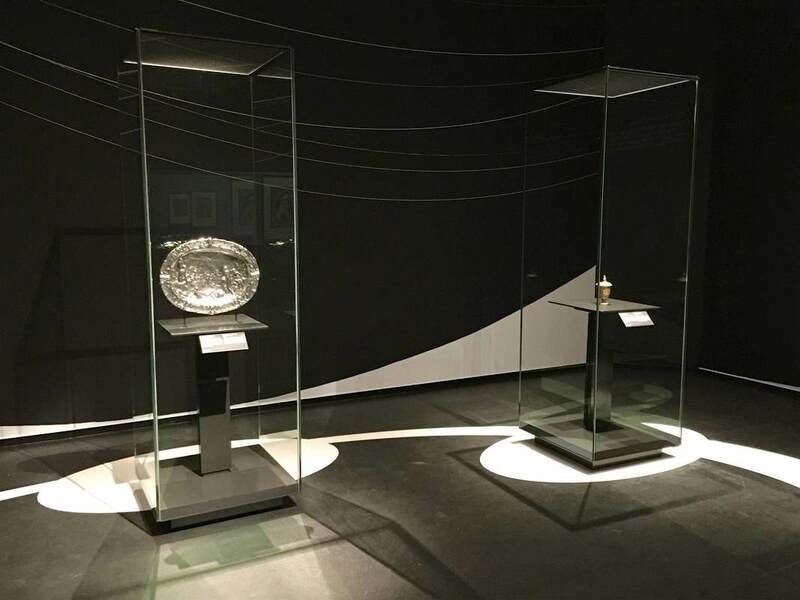 The tiny silver pitcher above (right) gets an injection of energy from the white rays radiating out across the floor. They turn the pitcher into the source of a geometric explosion, and who doesn't want to look closer at that?? 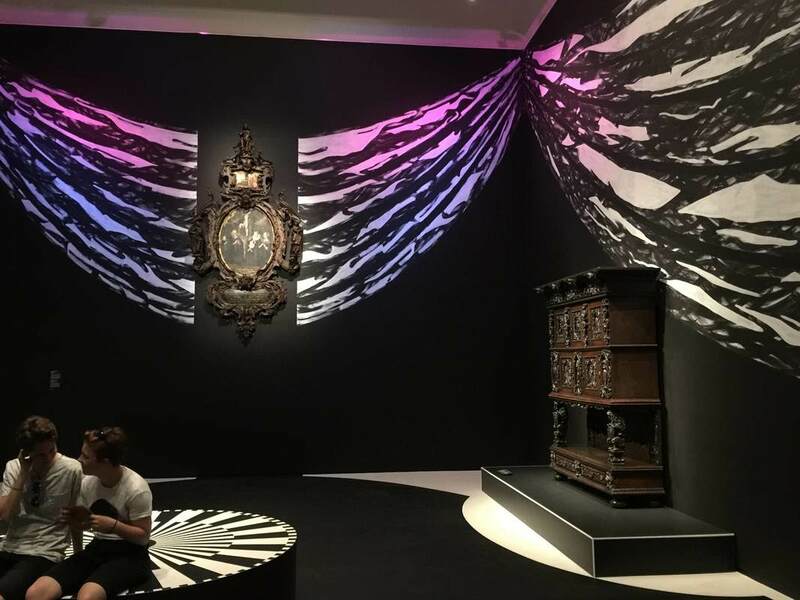 ​The same black-and-white painting technique on the walls is used in another way, namely to recreate a sense of the objects' original context. Keeping the monotone palette is a nice way to keep the "reconstruction" attempt from becoming distracting, while at the same time contextualizing objects rather unfamiliar to a modern viewer. In the photo below, the oval painting in an elaborate wooden frame is hard to imagine wanting to hang on your living room wall; but with the illusionistic swags of drapery emanating from it, it gains the elegance and appropriateness to the opulent display context it was originally meant for. 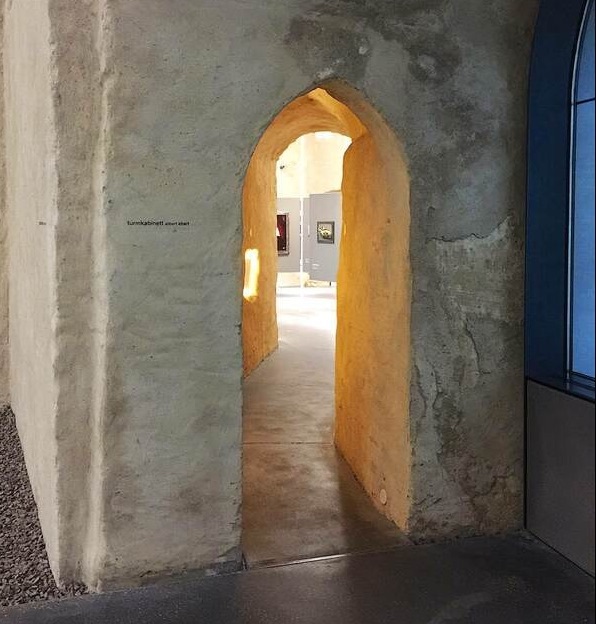 In both the room above and that shown below, the wall and floor painting is used to encourage us to move through the exhibition in certain ways. 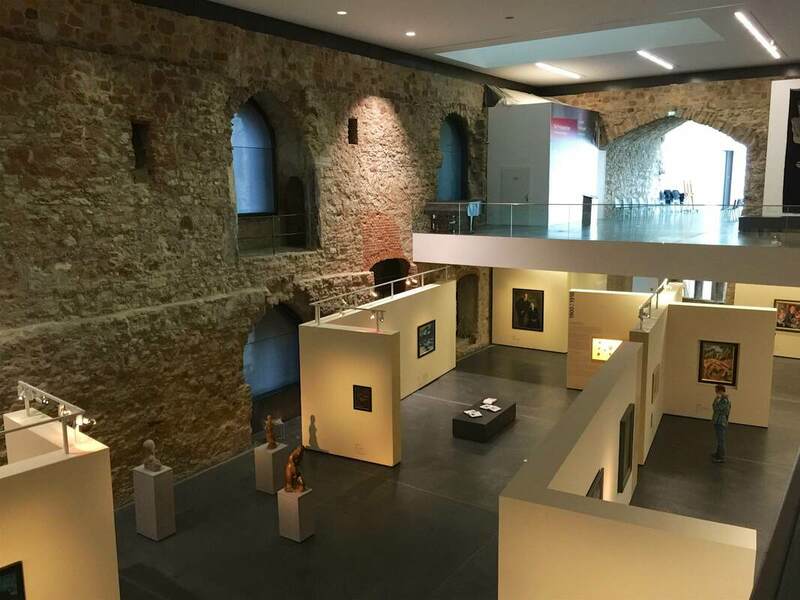 Above, a long white band leads us from the bottom right (a doorway is just off the photo to the right), along the wall of drawings, and over to the paintings at left, where the half-circle of white under the center painting encourages us to linger. Such a simple and effective device as these paintings seems worth keeping in mind. Certainly, painting the floor will not often be possible in an exhibition, depending on the space (the Getty Villa's marble floors...). But for the wall paintings at least, I would be curious whether the extra cost and time for installation makes them practical or prohibitive. 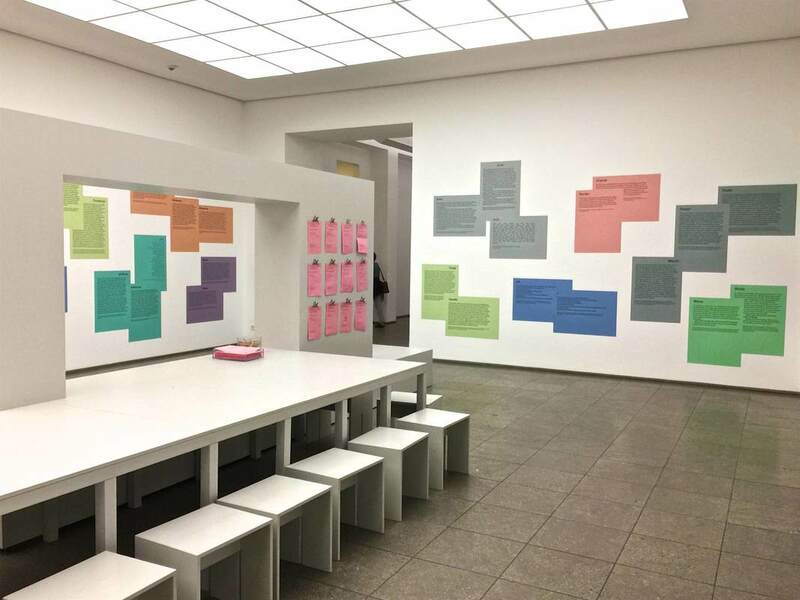 The feedback room of the Hamburger Bahnhof in Berlin impressed me with its way of cleanly showcasing visitor responses in multiple languages. In answer to a prompt (how would you define a certain term - values, trade, border, echo), visitors write their responses on paper sheets, some of which, presumably, then get printed onto the big colorful sheets you see on the wall. 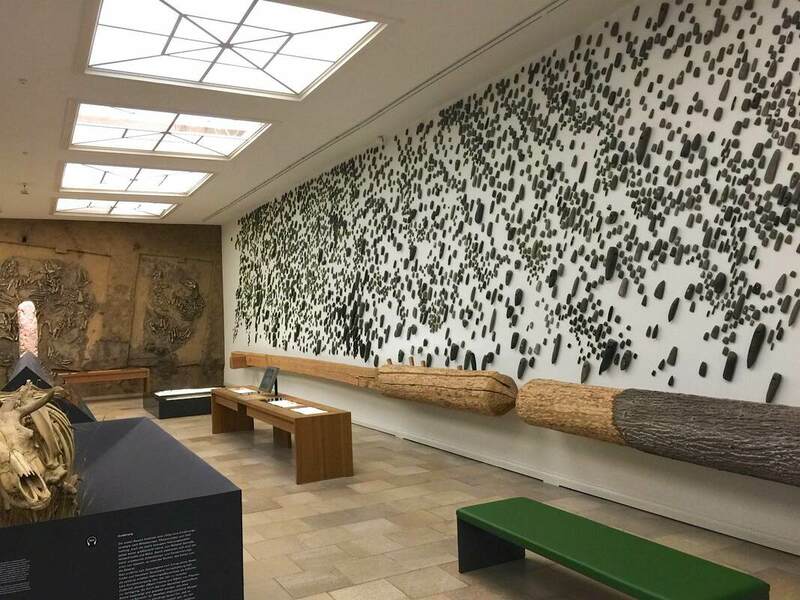 Emphasizing that the visitors respond in many languages, the museum has hung a copy of the original language beside one translated into English—overlapping, so that they are visually clearly joined. Rauschenberg (Salvage series) speaks Mughal miniature. For two more days, the Hamburger Bahnhof in Berlin is showing its critical exhibition Hello World. Divided into "chapters" which all have their own titles and are housed in different arms of the building, the exhibition as a whole addresses one question: What would a collection of contemporary art like the HB's look like if it weren't so Western-focused? Needless to say, particularly with the Humboldt Forum being built not far from here, this topic is urgent. Because I want this blog to continue focusing on design elements (for now, anyway), here I'll just point out a few sources for reading more about the immense debates that this show takes on. 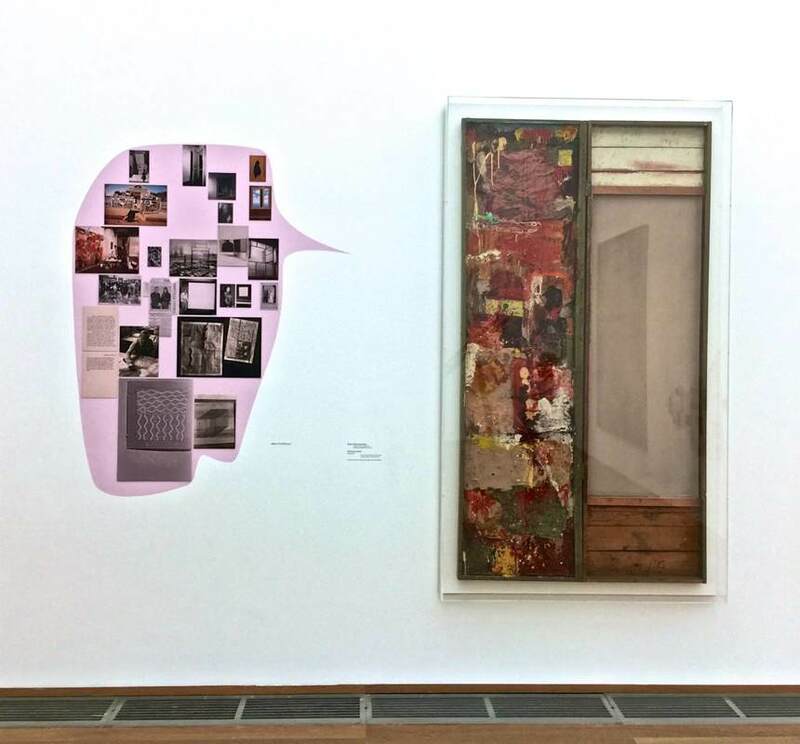 The "chapter" formed around a part of the permanent collection (the Erich Marx Collection, above), titled The Human Rights of the Eye, features the works of Rauschenberg, Warhol, Twombly, and others that don't fit into the exhibition's diversity- and global-oriented themes. To frame them in the terms of Hello World, the curators invited the graphic arts duo cyan to intervene. 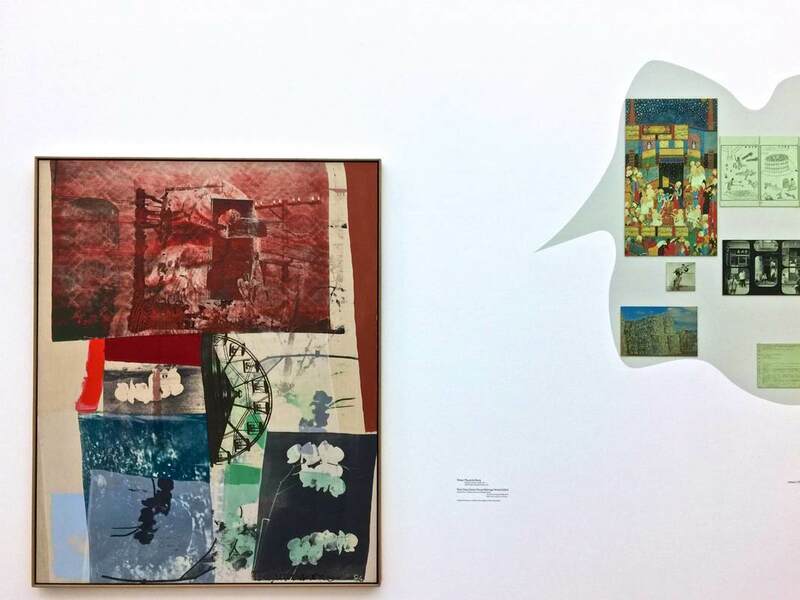 The artists created collages beside the Marx Collection paintings, each collage reflecting visual aspects as well as content from the painting nearby in order to "trace the multilayered cultural interweavings" in the paintings. I did not feel that this was successful to the point of recasting the collection as "global;" nonetheless, I liked very much the dialogue between modern masterpieces and contemporary collages offering a cloud of associations. 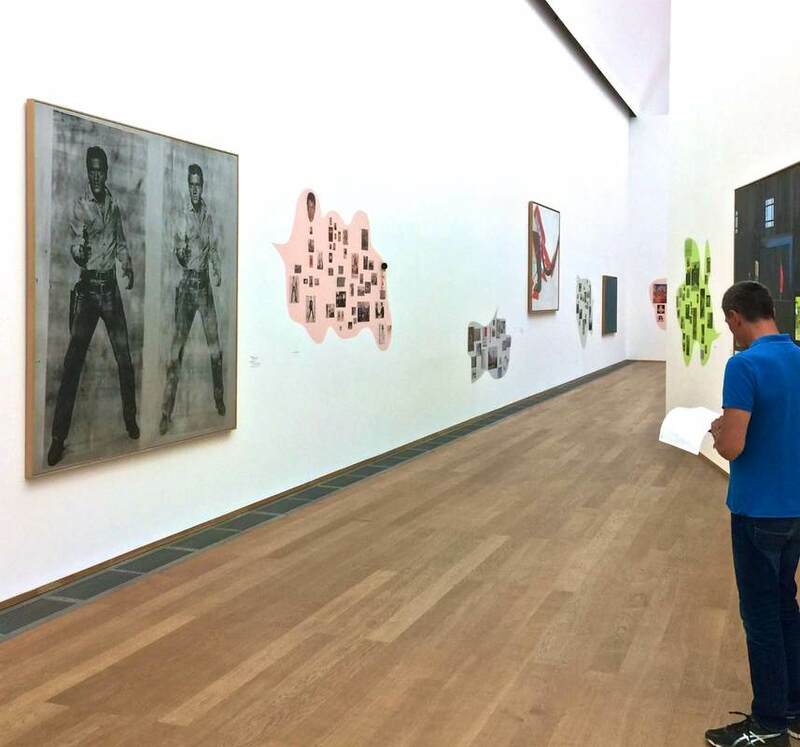 I can imagine this format—particularly the large shapes like speech bubbles emerging from the artworks—for all sorts of material relevant to the object, including the usual label information, relevant archival material, or even calendar listings for related events in the museum. Here of course the focus was rather on the collages as art themselves. 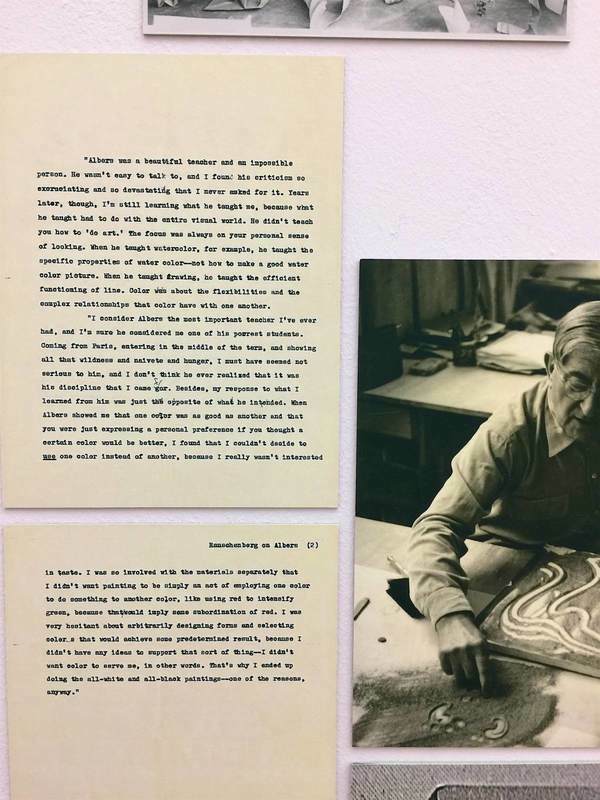 Still, one collage included archival material in the form of a letter by Rauschenberg about his teacher Albers, which I found philosophically inspiring; see below. Rauschenberg (Pink Door) speaks archives. A final post about the glorious Tropenmuseum in Amsterdam! 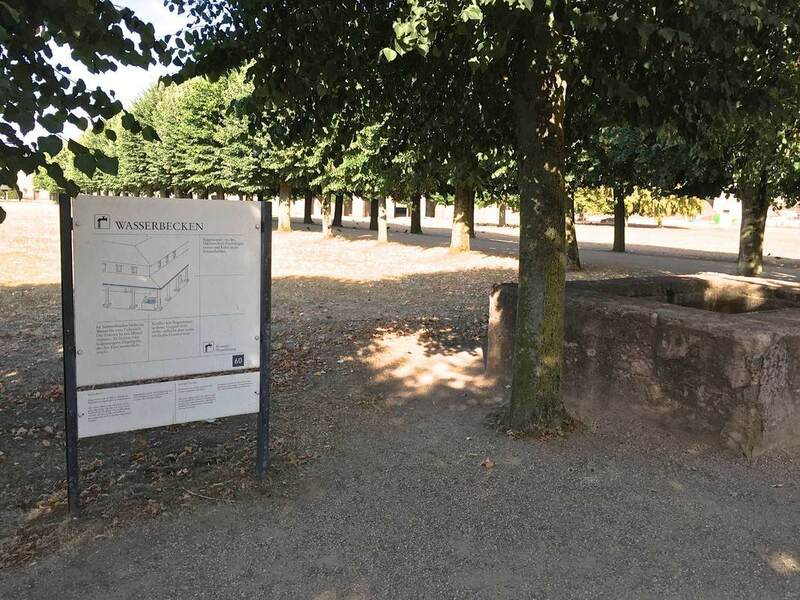 This time a technical apect of its permanent exhibition Afterlives of Slavery. Here the display technology resembles a bit the industrical metal grid in the Flesh exhibition currently on in Berlin. The difference is, here the grid is used as a platform for attaching all sorts of materials, not just hanging labels and pictures. 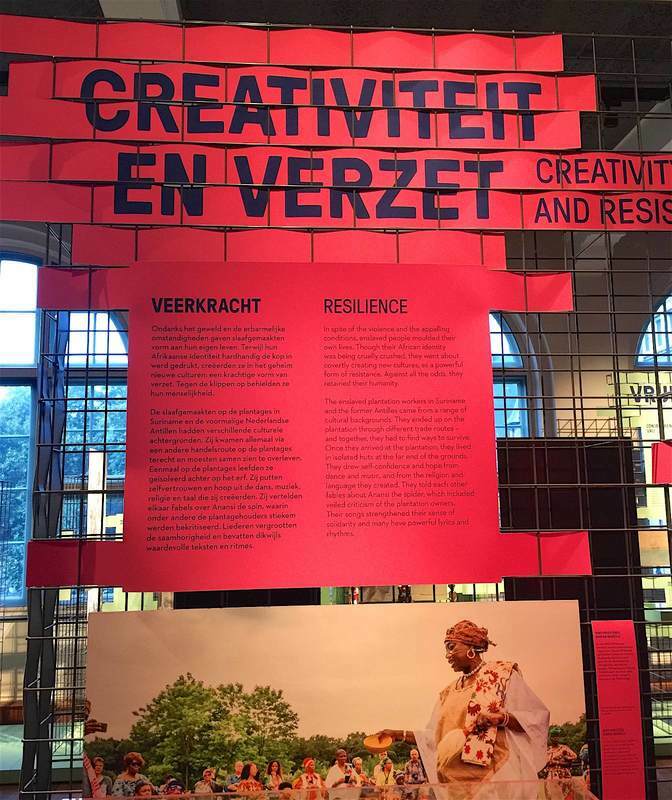 Most creatively, the structure is used to best advantage by being paired with a flexible plastic sheet on which the texts are printed; the plastic is cut into strips that can be woven directly into the grid! At right you can see two varieties of this technique, an overall-basket-weave at the top and a just-the-corners tactic below. Allowing infinite combinations and configurations is a huge advantage for such a material. I can imagine it being trotted out time and again for all sorts of different exhibitions, a handy device in the museum's tool box.